Manam Volcano, just off the coast of mainland Papua New Guinea, released a faint plume on June 28, 2009. 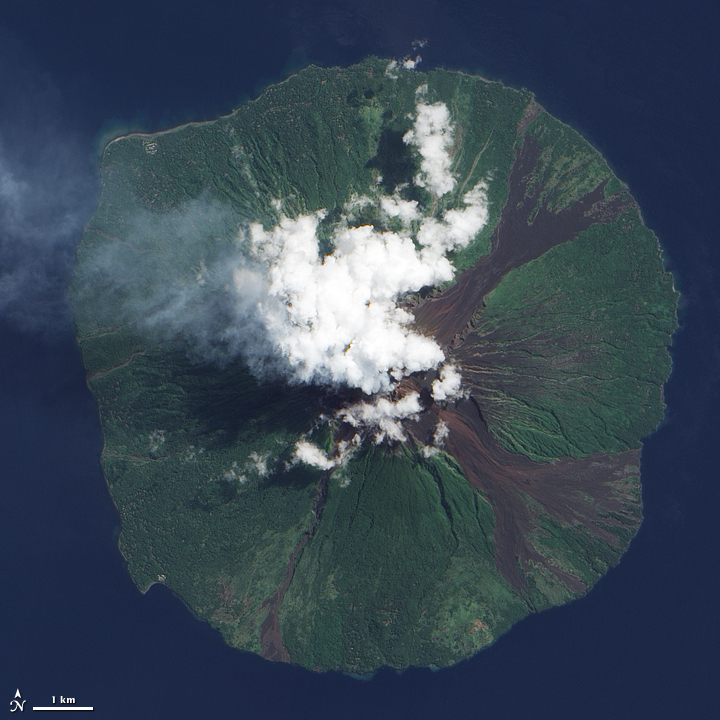 The Advanced Land Imager (ALI) onboard NASA’s Earth Observing-1 (EO-1) satellite captured this photo-like image of the volcano the same day. Bright white clouds hover over the volcano’s summit. Clouds often collect over peaks, but these clouds could result from water vapor released by the volcano. Slightly darker in color, a pale blue-gray plume blows west-northwest from the summit and over the Bismarck Sea. Just 10 kilometers (6 miles) across, Manam is a stratovolcano composed of alternating layers of ash, lava, and rocks from prior eruptions. The circular island sports four radial valleys spaced roughly 90 degrees apart, and these valleys have historically channeled lava and pyroclastic flows—composed of hot rock, gas and ash—sometimes all the way to the coast. Evidence of earlier volcanic activity appears as rivulets of rock that interrupt the vegetation coating much of the island. Although clouds hide the summit in this image, the summit is known to support two craters devoid of vegetation. Manam is one of Papua New Guinea’s most active volcanoes, and it has occasionally caused casualties, including 13 deaths from a pyroclastic flow in December 1996, and four deaths from a mudflow in March 2007. Large eruptions in late 2004 forced the evacuation of the entire island. This true-color image shows clouds, possibly from volcanic vapor, hovering over the summit of Manam Volcano while a plume blows toward the west-northwest on June 28, 2009. 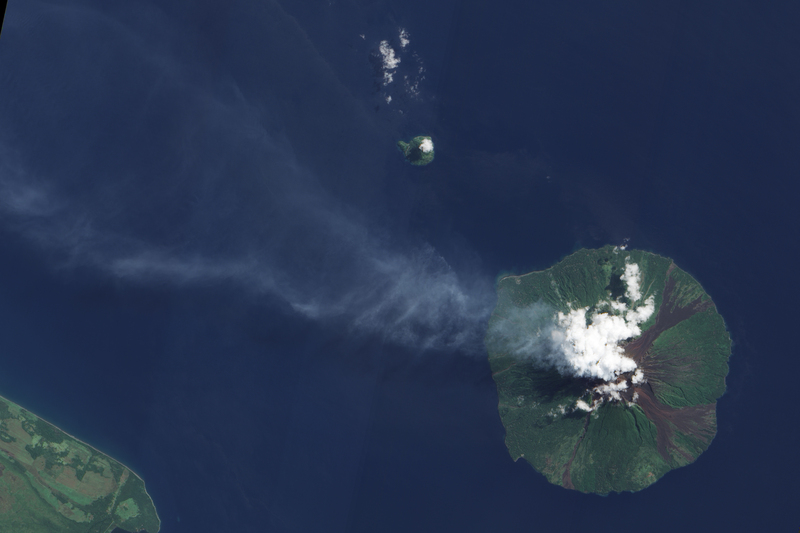 Manam Volcano off the coast of Mainland Papua New Guinea released a faint volcanic plume in late June 2009. Global Volcanism Program. Manam. Smithsonian Institution. Accessed July 8, 2009. Seach, J. Manam Volcano. Volcano Live. Accessed July 8, 2009.